HER: Marvel is so much better than DC. ME: I can prove that wrong by saying a single word. HER: I asked you not to do that. That said, Marvel has mopped the floor with DC in two key areas: digital comics and feature films, and with their Marvel Unlimited service they have done something so superawesome that if it was done by DC I might never read a real book again. 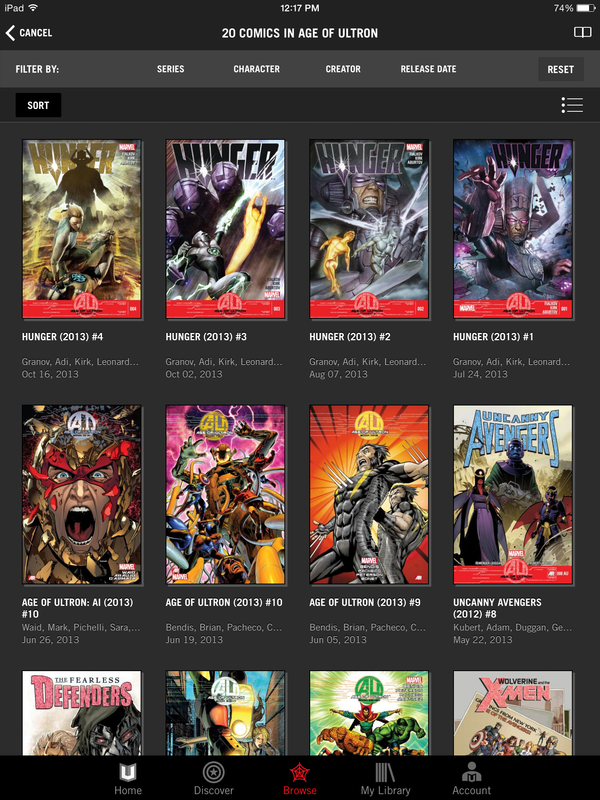 The high concept for Marvel Unlimited is very simple: Netflix for comic books. 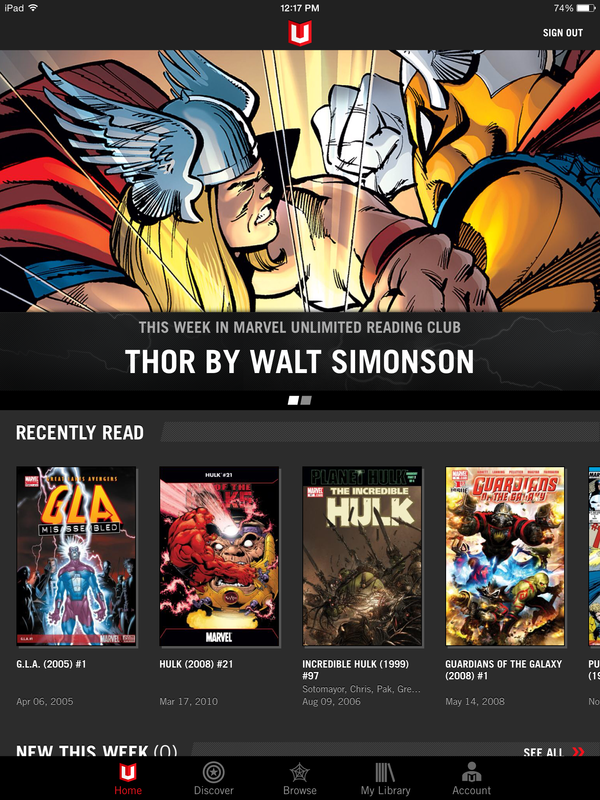 For $10 a month or $70 a year, you can subscribe to a service that delivers a huge pile of the entire marvel backlist right to your tablet or computer. A real comic costs about $3-$4 now and a digital comic about $2, so if you read 5 comics you’ve broken even. 15,000 comics and growing, from Marvel #1 up to about 6 months ago.That includes 1,432 issues of Spider-Man, 1,301 Iron Man, 837 Hulk, 888 Captain America, 882 Thor, 1,528 X-Men, 701 Avengers, 790 Fantastic Four, and on and on. Yes, there is a delay for new comics. August and September issues seem to be coming online right about now. 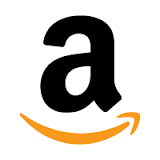 They’re not giving away the whole store for $10 a month: just a fairly largish chunk of it. The scans are bright, clean, and easy to navigate, with a full page view and a panel-zoom view. I’m not fond of the panel view because it tends to clip some of the edges, but the full page view is perfectly readable and can be zoomed for greater clarity. You can either read them on WiFi, or store up to 12 for offline reading. Even more impressive is the way the content is curated and searchable. You can pull up all the issues by any writer or artists, or any character appearance in any comic. If instant access to 241 Steve Ditko comics, 720 Jack Kirby, or 572 by the Romitas doesn’t give you a bit of a thrill, then you’re reading the wrong post. 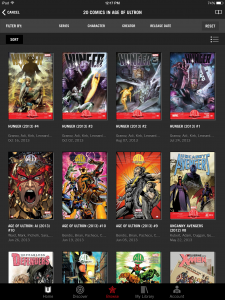 My favorite feature is the “Comic Events” sort, where you can find every issue, in order, involved in certain storylines like House of M, Civil War, and Age of Ultron. 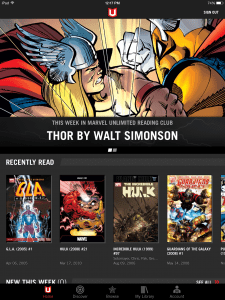 This allows you to follow storylines as they snake through the entire shared Marvel universe. Download the Marvel Unlimited app for free to see what you think, and subscribe here if you want to try it out. Look, snot happens, and Gesundheit! (iOS: free, Mac: $5) just wants to put it to good use. The game, one of the better titles in the app store, was pulled for a while because of developer/publisher issues, but it’s back now and to bring attention to its return, it will be free for a limited time. I imagine there are quite a few people who won’t be able to muscle past the premise of Gesundheit! in order to enjoy the treasures of the gameplay itself. Their loss. Sure, it’s a game about a little green pig whose allergies are so horrible that he sneezes giant globs of snot across the landscape. And, yes, said landscape is populated by monsters who find these globular goodies so unbelievable tasty that they’ll ignore that temptation to eat fresh green pork, at least for a few seconds. But once you get past all the booger blasting and snot snacking, you’ll find a game that’s not only fun and clever, but even charming. Much of this charm comes the visual style of Gesundheit!, which is striking, colorful combination of storybook backgrounds and and child-like drawings. The music, animation, and art are all the work of Matt Hammill, while the game itself is made by Revolutionary Concepts. Thanks to the graphics, none of the mucous mechanics ever come off as all that gross. Believe me, I’ve seen apps that go for the gross-out just because that’s the only arrow they have in their quiver, but Hammill isn’t working that side of the street. His sneezing piglet is just a cute little outcast who turns his problems (horrible allergies) into an asset, making him a kind of superhero of snot. The game is comprised of 40 single-screen levels, with gameplay that combines puzzle solving with some stealth-strategy elements. Each level has a monster (or monsters), and the now-ubiquitous triple-star challenge. The goal is to collect as many of he stars as possible before trapping all the monsters inside monster-eating traps. This is done by luring the monsters into different areas of the maze-like map with your gourmet nose nachos. Simply tap the pig, draw back to choose force and aim, and fire away. If your loogie lands where a monster can see it, he’ll ignore you and run straight to his favorite snack, even if it’s inside a trap. Lacking a snack, the monster will run straight for you, and you need to shake him by sneezing, or try to just lose him in a maze. The trick is luring monsters away from the stars without letting them walk over the stars, which they’ll crush. And then luring them to the traps. And then not gettin’ et. Although there are puzzles I still haven’t been able to solve at the 3-star level, basic level-completion is only moderately difficult, making this a good choice for both kids and adults. There’s a timed element to the game, and you’ll need to think pretty fast on your feet in order to escape certain monsters. This is a wonderfully weird and appealing little puzzler with some genuine challenges. Don’t be put off by the theme. Within a few minutes, you’ll forget you’re defeating evil by wielding the mighty power of boogers and just lose yourself in the clever puzzles and wonderful graphics. Content: Rated: 9+. Game includes boogers. And monsters. And monster boogers. You have been warned. Note: I’m taking a break from App o the Mornin’ this week. Too much to do on the magazine and elsewhere. Jack Lumber hates trees, and he has a good reason: trees killed his beloved granny. Now, Jack has sworn everlasting vengeance against all forms of lumber. He has an axe, he has a mission, and he has a woodchip on his shoulder. For example, there is a completely random animal-collecting element which allows you to stack up critters in your log cabin as you encounter them in the game itself. Why is it there? Who knows. They don’t serve any purpose other than a bit of comic relief in between levels. It’s like asking why someone randomly shouts “PLAID” when you make a cut. Why? Because it’s funny. Each level begins with logs of various shapes and sizes tossed in the air. When you touch the screen, time slows down. You need to trace a single line through the ends of each log, cutting them crosswise. When you lift your finger, the cuts execute all at once. If you missed a log, traced over a side rather than an end, hit an animal, or didn’t cut through every single endpoint, you’re penalized. Enough penalties and you fail the level. Sometimes you need to pass through the same log multiple times to use it, or break bottles of syrup (purchased back at your cabin) in order to slow down time. There’s a lot less luck involved than in most slicing games. You really need to examine the screen quickly and find the fastest and most effective way through each log. This makes the game more like a rapid maze, since if you take a wrong “turn” with your finger, you’ll mess up. Good humor, strong production values, and a dexterity element that also requires quick thinking: Jack Lumber is a winner all the way through. Cut the Rope is one of the best and most successful mobile games to date, with over 100 million downloads and a shelf of awards. So when the Russian team at ZeptoLabs did a follow-up to their hit franchise, gamers paid attention. Pudding Monsters (iOS/Android: $1) are little blobs of jello that slide around on a chess-like board. (As with another good game–Pudding Panic–“pudding” is used in the more European sense of “dessert.”) Each blob occupies one square, and can move along the rank or file by simply swiping them in the direction you want them to travel. One problem: if there isn’t something else on the board to stop them, they’ll shoot right off the edge and the puzzle is lost. If they hit an object, they stop. If they hit another monster, they fuse with it. The goal is to get all of the blobs 1) fused and 2) covering all three stars on the board. It’s not usually too hard to slide the monsters until they blend, but sliding them so that the last one merges with the whole monster-blob on top of the third and final star is a bit more tricky. Along the way, new kinds of monster-blobs are introduced, including “frozen” blobs that need to activated, green blobs who leave a slime trail which allows other to stick rather than shooting off the end of the board, blobless eyes who need to be reunited with their blobs, and so on. There are 75 levels spread over 3 worlds, with more levels coming. As sliding puzzles go, this is a lot of fun with a cute art style and a moderate challenge level. Is Pudding Monsters the next Cut the Rope? Probably not, but it’s very very good and a worthy follow-up that shows Zepto still has some tricks in their bag. Sometimes getting things done isn’t a matter of inspiration and talent or even motivation, but of just sitting in the same place for 30 minutes and refusing to move or shift your concentration from anything other than the task at hand. For me, the task is writing, and I can usually turn out a column in about 30 minutes, if I’ve already thought it through before sitting down. For you, the task could be anything, from paying bills to completing a work project to reading a long and challenging novel or a section of the Bible. Every task takes a certain amount of time, and when seen as a whole that time can be overwhelming. You think, “I have to write a book, and it will take 3 months, and I simply cannot face that.” But, of course, 3 months is 12 weeks is 90 days is so many hours and minutes and seconds. Each giant task can be shaved into smaller, more managable tasks. When you approach a task this way, you’re not thinking of 3 months of work. You’re thinking of the next 30 minutes of work. That can be followed by 10 minutes of email or Facebook or solitaire or Cute Overload. And then you can move onto the next 30 minutes of work, and the next. Or make it 15 minutes, or 45, or 60: whatever fits your method of work. The pomodoro technique uses 25 minute slices, with 5 minutes for a break, and a longer break after after 4 slices. Seems to arbitrary to me, but it works for some. I use 30/30 (iOS: free) to manage my time slices because it’s easy to use, it lets me set my time quickly, and keeps everything on a single screen. I like it because it uses a clean, gesture based interface with a lot of color to separate different kinds of tasks. It’s a simple matter to set a series of timers for a work day, adding a little icon and unique color to each if that’s your thing. In between each task, you can set a break time and then follow with the next task. All the tasks line up in a vertical column and can dragged into any order or deleted. It’s easy to skip a task, move to the next task, or delete a task with tap. There’s a clock at the top that will calculate how long the current task list will take to finish. The app is free, but you can buy icon packs if you like. I don’t need icon packs, but I got one anyway to support the developer because it’s a useful app. Productivity is a tough thing to master, and you can waste a huge amount of time playing with methods and lists and whatnot. Really, it doesn’t need to be complex. You need a task manager (even if it’s just a handwritten list in a notebook) and you need a timer. There are plenty out there and you can dig deeply into methods and tools, but I think that’s a waste of time, and I know, because I wasted my time doing it. 30/30 is a good little time management app. Give it a shot. Remember getting your little cardstock rice bowls each year at CCD class, folding them into shape, and dropping in change to support Operation Rice Bowl? You can still do that (and you should) but you can also bring the practice into the 21st century with Catholic Relief Service’s Rice Bowl app (iPhone/Android: free). CRS has created a series of daily meditations for Lent–some original, some from the writings of Pope Francis–with a focus on Catholic social teaching. All of the meditations come with the app, so it works offline as well as online, and you can sent daily reminders for a particular time. The app also allows you to create a daily “sacrifice” for Lent, and tracks the things you’re giving up with a suggested value: $1.75 for a cup of coffee, $4.69 for a fast food combo meal, or any custom sacrifice with its name and cost. The idea, of course, is to give up things and allocate the money as a donation to CRS. This donation can be done from within the app, and it’s a pretty clever way of measuring the things we give up for Lent and turning them into a practical good through CRS, which does great work around the world. A number of meat-free recipes and “Stories of Hope” (video and text) from people helped by CRS are included as well. It’s a very effective use of technology to combine prayer, Lenten observance, and action. CRS has done a great job on this. Take it Easy (iOS: $2) is a rather nondescript title for what was, when it was released as a board game 20 years ago, a remarkably innovative twist on bingo. The game is played on a hexagonal board comprised of 19 hexagonal spaces. Players blind-draw hexagonal chips, each marked with lines going in three directions (1 vertical and two diagonal). There are nine different colors of line ranging in point value from 1 (gray) up to 9 (yellow). These tiles are laid on the board so that, wherever possible, the lines of a single color connect without interruption from edge to edge. If you manage to make an unbroken line, you get the point values for all the tiles in that line. So, a 5-tile gray line is worth 5 points, while a 5-tile yellow line is worth 45. As the board fills, it gets harder to place tiles without interrupting a line of color, leading to a remarkably subtle but complex set of strategies for maximizing point values. The highest possible score is 307. The mobile version implements the design with colorful visuals and a nice drag-and-drop interface. They’ve also expanded the idea with new game modes: Progressive and Puzzle. Progressive is a timed mode with bonus stages. You’re trying to fill the board before the clock runs out, earning a certain a minimum score which increases each round. Leftover time rolls over to the next level. The goal is to go as long as high as you can before the time runs out or you fail to score enough. Puzzle mode isn’t hugely challenging, but it’s a fun diversion. You need to make certain patterns, scores, designs, or kinds of placement to clear a level, sometimes withe restrictions like locked spaces. The app includes internet and local play for up to four people, with various modes and round options. As with the original game, the app can be played solo or multiplayer for up to four people. It was never a particularly interactive games: people draw until their boards are filled, total up the score, and highest score wins. It is, however, as great a puzzler as it ever was, and the mobile version is a fine way to rediscover it. Content: No issues. All ages. And boy does it do that: in spades. I’ve had The Mass Explained for a couple weeks, but I wanted to make sure my initial gee whiz impression of the technical aspects wasn’t influencing my appreciation of the content. This is, really, a book, but it’s a book for the digital age. It does things you wish some books could do, and it does them extremely well. The author, Dan Gonzalez, merges solid research with a strong catechetical style and a superb sense of design to create something new in Catholic circles: a high-end multimedia learning experience that fulfills the promise of new media in the new evangelization. The book itself begins with an introduction by Mike Aquilina, and then walks through–step by step–the origin, meaning, development, and practice of the mass from every angle. We begin with a look at the passover seder, then take guided tour through the practice and meaning of the Liturgy of the Word all the way to the Prayer of the Faithful in the course of about 330 pages. The main part of the screen is book text, which explores in some depth the meaning of the Gloria. Footnotes are on the left, and flesh out certain elements of the main text (in this case, the sacred music of Vivaldi). At the bottom of the first page, you’ll notice a sound icon. This brings up examples of the Gloria from Palestrina, Vivaldi, Mozart, Schubert, and Puccini. The book is undeniably impressive in both content and execution. It’s a catechist’s dream, at least if the catechist is teaching a room full of people with iPads. Here’s where we come to my one reservation: at $25, it’s expensive for an app and even expensive for an App Store book. As they say of big budget movies: it’s all up there on the screen. The production values are top notch and the writer has done a great deal of work producing the text and adding multimedia content. There’s no denying it’s a slick piece of work. I don’t begrudge the creators their price point, but it does limit the audience. The good news is that, purchased in volume (20 or more copies), it qualifies for Apple’s Volume Purchase Program, which offers a 50% discount. Honestly, though, the price is my only reservation. This is an excellent app that explains the richness of the mass in the format and depth it deserves. It’s one of the best Catholic apps I’ve ever used. The app has received two declarations from the Church assuring that it is free of doctrinal or moral error. The Nihil Obstat was granted by Monsignor Terence E. Hogan, SLD, Dean of the School of Theology and Ministry at St. Thomas University. The Imprimatur was granted by The Most Reverend Thomas G. Wenski, Archbishop of Miami, FL on October 14, 2013. The app was also reviewed by the International Commission on English in the Liturgy (ICEL) and the United States Conference of Catholic Bishops (USCCB). Approval from the USCCB was granted on December 20, 2013 by Monsignor Rick Hilgartner, Executive Director, Secretariat of Divine Worship. Uwe Rosenberg’s board game Agricola has been perennial favorite since its release in 2007. Winner of the 2008 Spiel des Jahres award for “Best Complex Game,” it’s one of the finest examples of the “worker placement” genre, with rules for both family and advanced play making its complex mechanics more accessible. The iPad version of Agricola (Playdek: $7) is one of the best conversions of a tabletop game to date. Set in 17th century Europe, the game focuses on surviving in hard times. The plague is over, and poor rural families are rebuilding their farms piece by piece. You and your spouse begin with a small hovel, a few meager resources, and only the sweat of your brow to help you survive. Agricola is played over six stages of 14 rounds each. Each round, players place tokens representing family members on locations throughout the town. This allows them to collect resources or perform actions in order to build up their small plot of land. They can gather building materials, food, or animals; improve their spread by plowing fields, upgrading their home, and adding features like barns and fences; and add various improvements and more advanced occupations such as beer making (to provide extra food) or thatching (to use less reed when building). Every few turns, there’s a harvest, when crops are reaped, animals reproduce, and you need to have enough food to feed your family. After all stages are completed, victory points are totaled based on how far you’ve developed your farm, how many animals and family members you have, and other improvements. It’s actually a fairly complex game, and even in the “family” version, there’s a bit of a learning curve. This is helped along in the app thanks to a detailed tutorial and a complete manual, but it still takes a little time to get a grip on so many decisions. The app has superb production values and is a faithful adaptation of the original. The graphics are attractive and fun, and the layout is sprawling without being overwhelming. You have to scroll along the entire length of a game board to see all the possible actions, but this is preferable to trying to cram too much data onto a single screen. The farmstead, represented by a card overlaid with squares in the conventional game, is found on a separate screen in the app. All of it blends together quite well, and after about 30 minutes worth of tutorials are done, you’ll have a sure sense of the mechanics even if you’ve never played the original. There’s good solo support as well as online play with matchmaking. Content: No issues of note. Bumpy Road (iOS/Mac/PC: $3) is the sophomore effort from the creators of Kosmo Spin, and it has a delightful aesthetic, with a muted but eye-catching color palette and charming art. It’s a look that works perfectly for game about an older couple out for a Sunday drive on a corduroy road past windmills and impossibly narrow houses. The gameplay is just as interesting as the visual element. Bumpy Road uses a novel mechanic to create a twist on the 2D platforming, move-to-the-right genre that has thrived on mobile touch devices. In this case, you don’t control the car, which moves at a steady pace, but the road itself, which is comprised of a series of little bumps. Touching the road raises it a little bit. Touch behind the car to create a hill that makes the car go faster. Touch in front of it to create a hill that slows the car down. Touch beneath it to make the car hop. It’s as simple as that. The levels consist of multiple platforms and occasional water hazards, with minor variations for the two gameplay modes. In Evergreen Ride, you need to go as far as possible without falling into one of the water hazards. The trip is endless, with little powerups found along the way to close traps and allow you to focus on gathering items to improve your final time. There are no traps in Sunday Trip mode, so the goal is to get to a finish line as fast as possible by grabbing the accelerator powerups and avoiding the brake powerups. The result is a great little app, with a novel mechanic and engaging gameplay.